Up until July 2015, Pluto’s largest Moon, Charon, was just a pixel in terms of what we knew about it. That all changed when NASA’s New Horizons spacecraft zipped through the system, revealing craters, deep crevices, valleys, and mountains on the distant moon—surface features that now have formal names. Dorothy, Butler, Kubrick, and Nemo—these are a sampling of the new names given to some Charon’s most distinctive surface features, as proposed by the New Horizons team and approved by the International Astronomical Union’s Working Group for Planetary System Nomenclature. Some of the names, such as the Argo Chasma (a canyon) and Kubrick Mons (a mountain), were already in use by astronomers, but the IAU’s ruling now makes them official. Map projection of Charon, Pluto’s largest moon. 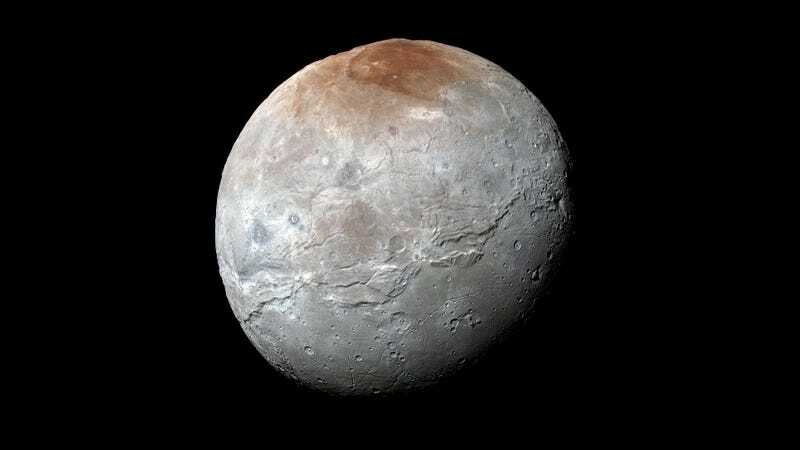 Charon is the largest of Pluto’s five moons—it’s almost half the size of its host dwarf planet—and at about 750 miles (1,207 kilometers) across, it’s among the largest celestial bodies in the Kuiper Belt. New Horizons came within 17,000 miles (27,000 km) of Charon during its brief 2015 approach, changing what we know about it by several orders of magnitude. Some of the names come from the IAU’s OurPluto campaign, in which people from around the world were given a chance to contribute their ideas. The 12 new names are international in scope, recognizing “the spirit of human exploration, honouring travellers, explorers and scientists, pioneering journeys, and mysterious destinations,” in the words of the IAU. Pretty wild to think we’re naming surface features of distant worlds, but it’s only going to get better. On January 1, 2019, New Horizons will visit Ultima Thule, the distant Kuiper Belt object also known as MU69. So get ready for some new surface features, and another batch of new names.